Superbolt Theatre aka Simon Maeder, Maria Askew and Frode Gjerlow. Photo by Geraint Lewis. Can there be such a thing as perfect clowning? You might think it’s a hard art-form to measure objectively. 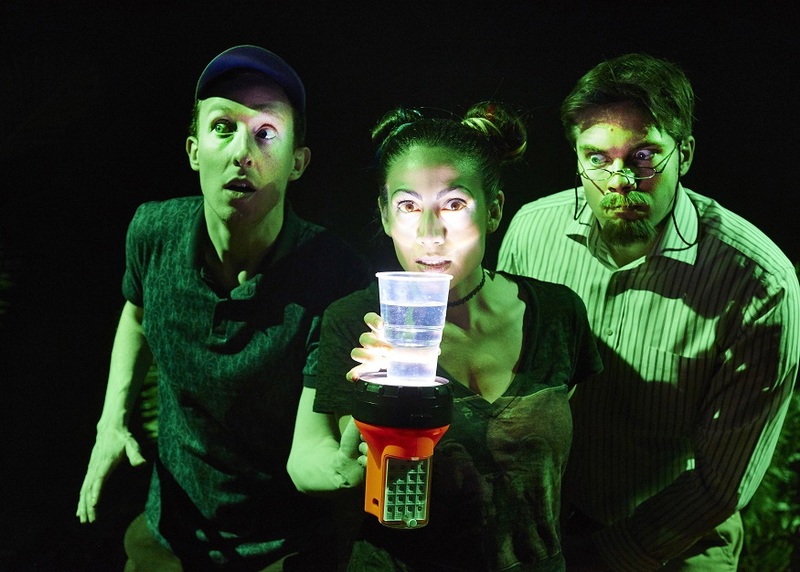 But in this case, it is possible since the trio of incredibly talented performers who make up Superbolt Theatre are recreating scenes most of us know well from Steven Spielberg's 1993 blockbuster Jurassic Park. This was in fact the original name of the show, though in order to dodge legal landmines it’s switched to Dinosaur Park instead. It’s not a very good title and the show doesn’t start in very promising fashion as the Park family — stroppy Jade (Maria Askew), naïve Noah (Simon Maeder) and embarrassing dad Terry (Frode Gjerlow) — bumble about the audience checking to the point of irritation that we’re all sitting comfortably. They're nervous because it’s an important night: a memorial screening of their favourite film, and they do have to be out of the community centre on time. It feels like calamity is coming and then the hurricane hits: someone left the VHS at home! Squabbling erupts until the only possible resolution presents itself — the Parks must act out the entire film live. If you’re now wondering how three people alone on a tiny stage can recreate iconic set-pieces such as the T-Rex chase or the attack of the velociraptors, you’ll be even more surprised to learn that all it takes is a rucksack, a soup ladle and a bit of imagination. There are so many delightful vignettes to take in here: from the hip-wiggling DNA strands that cause Terry to lose himself in his best dad dancing, to the hissing technology around the park which morphs variously into a game of patty-cake and an impromptu dubstep rave. Last night’s audience was agog throughout. What's even more impressive than the physical comedy is the detailed observation of family dynamics. There’s one person missing from the line-up and as the show goes on, that absence becomes surprisingly poignant. Dodging the mawkishness that Spielberg himself loves to indulge in, we get a desperately sad portrait of a family in crisis just underneath the tomfoolery. And it’s this emotional heartbeat that pushes the show into five star territory. The last few scenes wrung confused tears of joy and pain from the audience — impressively earned by these talented boys and clever girl. They've worked hard to polish the show up to its current glimmer with a year of performances at festivals including the Vault in London and the Edinburgh Fringe. Gjerlow and Maeder are also alumni of the improbably-named Jacques Lecoq School in Paris — a kind of Harvard for clowns that’s notorious for its intense regime as well as producing the best performers around. This is a great little show to kick the year off — and makes us look forward all the more to the upcoming London International Mime Festival and Vault Festival. Be warned now however, the St James Studio is tiny — so you may well have to use fang and claw to get yourself a ticket. Dinosaur Park runs at St James Theatre Studio until 23 January 2016. Londonist saw this show on a complimentary ticket.